Morning lovelies! I feel like I have been a bit MIA around here for the past two weeks. Basically I spent one week consumed with regular mom stuff and canning. It felt like my week was crazy full. Then the next week I was gearing up for shopping, shared a grocery haul on my channel, and then we got just got busy again. This weekend though things slowed down and I was able to get some blogging in. I love getting on my little space of the web and connecting with all of you. It is such a fun part of my day. So today I am sharing a few tips and tricks from when I canned salsa two weeks ago. Enjoy! I've been needing to can more salsa for months. I ran out over the summer and had to wait till the weather cooled down to restock my pantry. 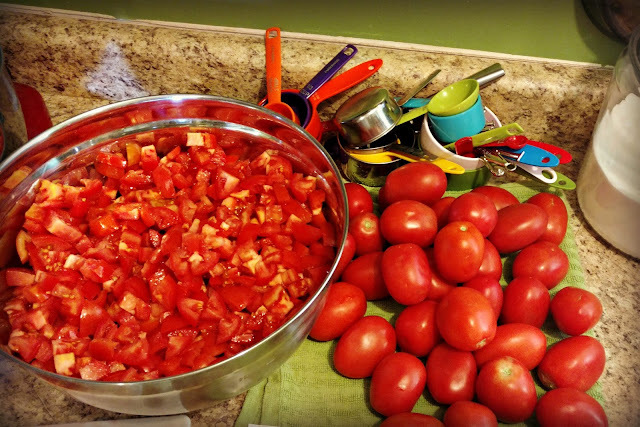 We've been without salsa for months, so when I saw bountiful baskets had 25 lbs of Roma tomatoes for $17.00 I did a little shout for joy. I ended up getting the tomatoes for 68 cents a pound. I bought 50 pounds of tomatoes. A quarter of that a shared with a friend, which brought my overall tomato cost to $25.50. I ended up canning about 37 pounds of tomatoes into salsa. I did this over a few days. I found time to cut tomatoes in-between school lessons and spent a few late nights canning and catching up on my chick flick watching. I'm one tired mama, but my shelves are full of salsa and that makes me REALLY happy. 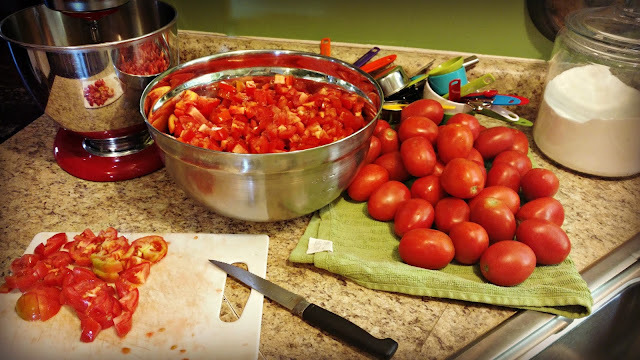 I've shared how I can salsa in the past, so today I thought I'd share a few tips to make canning salsa easier. 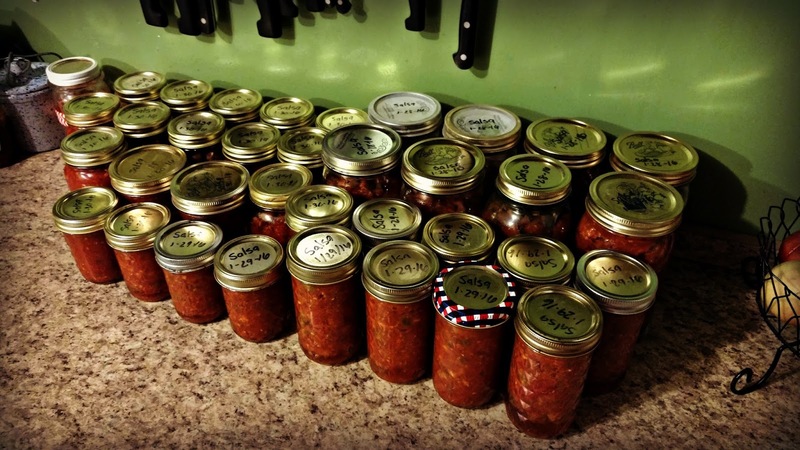 Canning is a constant learning process. I'm always finding new ways to cut down on time and create yummier jars of food. To save time, I sterilize my jars in the oven. Heat your oven to 225'. Place your jars in a roasting pan and place in the oven. I put my rings and lids in the pan as well. Allow them to stay in the oven for at least 20 minutes. Keep them in oven until you are ready to use them. This keeps them nice and hot. I also try to can enough for 6-12 months. That way when I can something, I can get a huge amount done and then not have to worry about canning that item for quite a while. We now have enough salsa for at least six months. As you can and use up your food storage, you'll get a better idea of how much your family goes through of an item and how long it lasts on your shelves. I am still learning this, but am getting much better at judging amounts. Remember I said canning is a constant learning process? 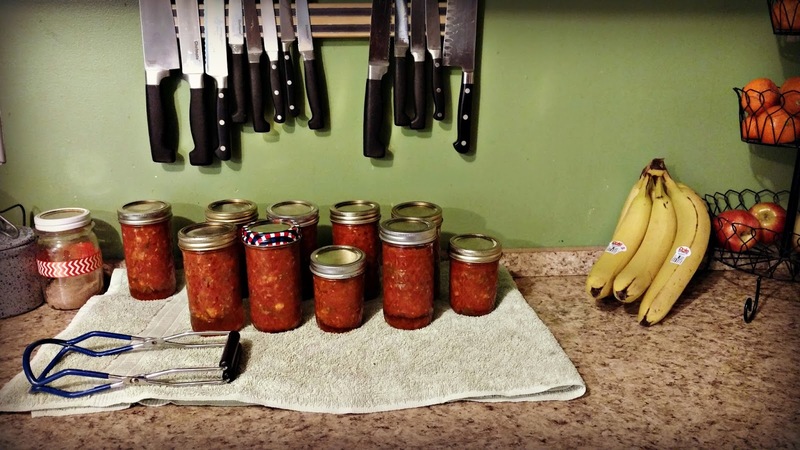 The last thing I like to do, to keep things easy when canning, is to can with a friend. 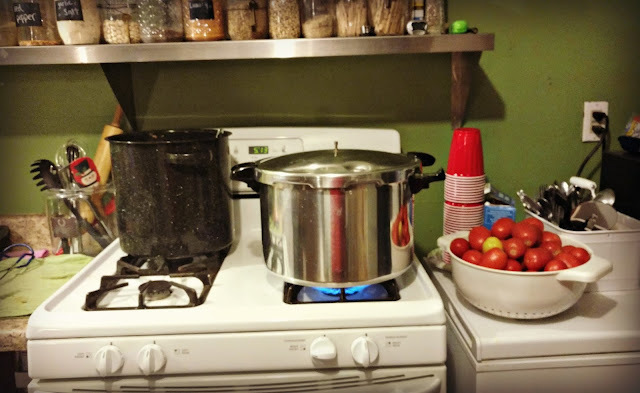 I had my friend Jen come over and we spent a night chatting and canning. It was a lot of fun. When I can solo, I always fire up my Hulu or Netflix to keep myself entertained. Canning can be a tedious process. Having something good to watch makes the time standing in the kitchen much easier. 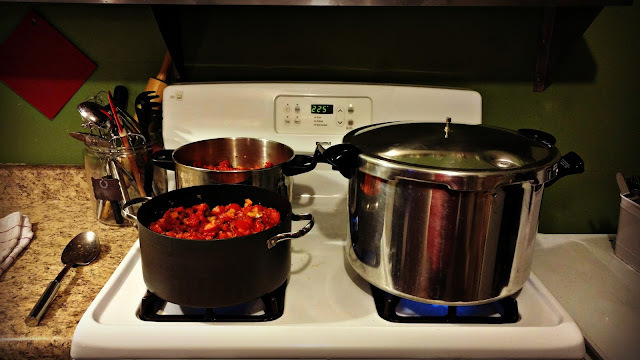 So there are just a few of my tips and tricks that help me when canning. I just ordered a case of pineapple, which I am sharing with a friend. I'll be sure to share my tips and tricks for how to can pineapples, once I pick up my order this week. I hope you are all having a fabulous Monday!! As long as you're processing at least 10 minutes, there's no need to pre-sterilize jars. It's a newer rule from the USDA. Looks great! I am trying to patiently wait until gardening season here to stock our pantry with salsa. I never find good deals on tomatoes of any sort in our stores.